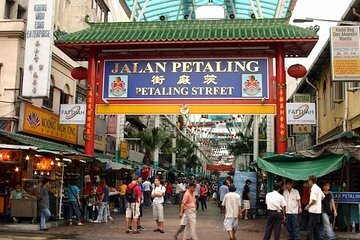 Lassen Sie sich auf dieser privaten, 4-stündigen Tour von einem persönlichen Guide durch Kuala Lumpur führen. Sehen Sie die Hauptattraktionen der Hauptstadt Malaysias, wie Chinatown, den Königlichen Palast (Istana Negara), das Nationaldenkmal, den Perdana Botanical Garden (Seegärten) und die Nationalmoschee (Masjid Negara). Hören Sie die Kommentare Ihres Reiseführers mit Abholung vom Hotel und Rücktransport. We booked a city tour with private guide to take us for a half day city Tour in Kula Lumpur but we were really surprised to see a taxi showing up at the front desk of our hotel.The taxi was nice but he just drove us around without knowledge of the area and asking us where we wanted to go.The experience was disappointing and not conform to the description so we decided to cut it short and come back home half way through.This seems more like a scam to me as we could have use a grab for a tenth of the price instead of using Viator.I won't use your services again as there is no value added and no delivery on the promise. Good tour, took me around all the major sights in the city. My only gripe was that the guide didnt come with me when I went to look at places he stayed in the car while I went and looked around. This wasnt super helpful, as sometimes you have a question that you want to ask them about the place while youre there, but you have to wait until you get back to the car by which time I sometimes forgot what the question was!. Also, as someone travelling solo, its nice when the guide accompanies you so that they can take photos for you if you want.